The protest s filmed through the glass bottle, light shatters through the medium of the bottle/glass. 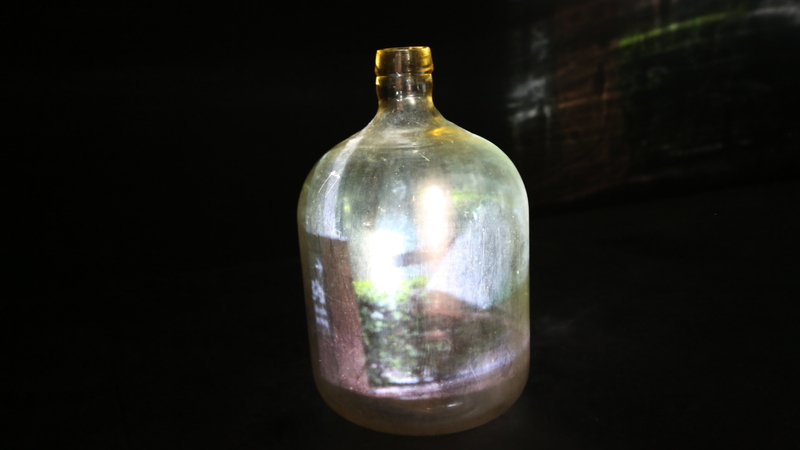 The bottle catches either just light, or the image of the people moving through glass, a medium already scientifically interesting as a liquid which feels solid, but is sand. The projection is then captured on the wall the people protesting moving, but stopped at this time of austerity. Will the bottle let its contents go? Or create shards that can split time? These specters of time past in time present are an indication that time present will be time past. It is humanity’s actions that will shape the final storyboard, and it can be a positive one of meeting human need. The questions of time/temporality and the consequence of being caught in a difficult time – austerity, war, dictatorship – are raised. Previous Protest scenes, it is right to protest,.